EDINBURGH.- The extensive collection of the late Simon John Noble, the laird of Ardkinglas House and Estate in Argyllshire, and, perhaps most notably, the founder of ‘Loch Fyne Oysters’ and ‘Loch Fyne Restaurants’, will be sold by Lyon & Turnbull at their Interiors Auction on the 25th January 2014. 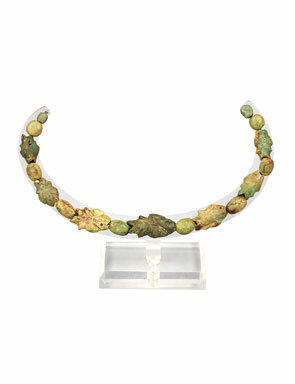 One of the more remarkable items in the collection is a 2,000 year old necklace valued at £1,200-1,800. Theo Burrell Antiques Specialist at Lyon & Turnbull said “This is surely one of the many interesting things from the collection of the late Simon John Noble, is one of my favourite items in the sale.